1.Boil the milk in a heavy bottomed over medium-high heat, stirring frequently making sure milk do not burn on the bottom of the pan. 2.As the milk comes to a boil, add the lemon juice slowly and stir the milk gently. The curd will start separating from the whey, turn off the heat. 3.Once the milk fat has separated from the whey, drain the whey using a strainer line with cheesecloth or muslin cloth just squeeze out the excess liquid and knead it gently with your hands. It is not required to hang the paneer overnight to drain out all the water as done usually. 4.Wrap the curd in a muslin cloth, rinse under cold water, immediately and squeeze well. This process takes out the sourness from the lemon. 5.To take out the excess water squeeze the cloth, or press the wrapped paneer under a heavy pan for about one hour. Taking the right amount of water out of the paneer is the most important part of this recipe. 6.Once the water has been drained completely, remove the soft paneer from the cloth onto a smooth clean kneading surface. At this stage the paneer will be crumbly and will not hold shape. 7. To check if enough water is out of the paneer, take a little piece of paneer on your palm and rub with your fingers. After rubbing the paneer for about 15-20 seconds, you should be able to make a firm but smooth ball. 8. If the paneer is too dry, add a few drops of water and knead the paneer for 3-4 minutes until the paneer is almost rolls into smooth soft dough. 9.Bring water and sugar to a rolling boil in a clean pressure cooker. Divide the paneer into 22-24 pieces and roll into a smooth ball. 10.If the ball breaks apart, knead and then roll into a ball. Slightly flatten the ball for Rasmalais. After the pressure cooker starts steaming, turn the heat to medium and cook for about seven minutes. 11. Make sure the cooker is large enough to accommodate the finished rasgullas patties, as they will expand to about double in the volume while cooking in the syrup! 12.Bring the 4 cups of milk to a boil on low heat, stir continuously to avoid burning. 13.The 4 cups of milk have to be reduced to around 2 ½ - 3 cups, this takes around 25-30 minutes. Yes, it takes time but well worth the wait. Stir in the sugar and cardamom powder. Also add the food coloring. 14.Squeeze out excess syrup from the patties and drop them in the milk once it has thickened. 15.Let theRasmalai patties boil for 3-4 minutes in the milk. Turn off heat. Transfer carefully to a container and refrigerate for 4-6 hours or more. 16.Garnish with slice pistachios and almonds before serving. Gorgeous, creamy and absolutely delish...I love rasmalai much..urs tempting me a lot..
Whooo, its very tempting. Ras malai fav' dessert. Love ur hard work. 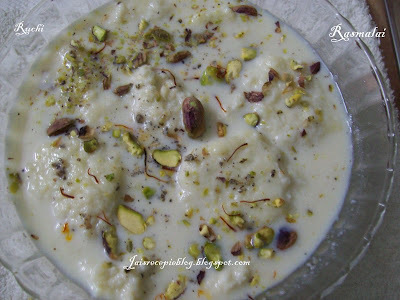 wow.. looks delicious.. mu fav dessort.. looks tempting..
Ras malai looks very much inviting jaishree. I too do it in the same way. superb! such a detailed recipe.. looks perfecto! Lovely dessert, picturea are tempting. i can finish that right away :) looks yummo! my fav... love it. looks soo great. my god that looks restaurant-like! perfect for the torrid weather here! Wow, supera iruku..Very tempting..But seems a long process..A worth to try..
woo this is my fav...it looks the same i usd to make with readymade mix...looks very tempting and nice snap..
Yummy dish , my first favourite sweet. Looks lovely too.. Thanks for the recipe. So far I used the ready made mix only:( will try urs soon. Great pics. Lovely rasmalai.. I was waiting to try this! 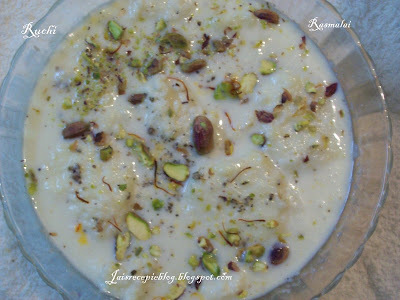 Rasmalai looks rich and yummilicious...How r u jaishree?